At a beauty pageant held for Angola's land mine victims, the prize is a prosthetic leg. Each contestant wears a glinting crown on her head and a white sash across her body. They are dressed in flowing American Apparel dresses or bathing suits, their hair and makeup artfully done. Each contestant is glowingly beautiful and missing a leg. This isn't your average beauty pageant, of course -- it's Miss Landmine Angola 2008. The primped and preened contestants are vying not only for the title but for a prosthetic leg from a leading orthopedic clinic. The Miss Landmine Manifesto reads: "female pride and empowerment, disabled pride and empowerment, global and local landmine awareness and information, challenge inferiority and/or guilt complexes that hinder creativity ... question established concepts of physical perfection, challenge old and ingrown concepts of cultural cooperation, celebrate true beauty, replace the passive term 'Victim' with the active term 'Survivor.'" The contest -- as well as its motto, "Everybody has the right to be beautiful" -- is the brainchild of Norwegian artist Morten Traavik. He visited Angola in 2003, shortly after the civil war ended, and found "a tragic and troubling reality, but also a great and profound joy of life." That contrast inspired him to organize an Angolan beauty pageant for land mine victims. He says, "I'd like the project to both move and provoke people. But if at any point I had perceived that Angolan society, and first and foremost the women themselves, didn't appreciate Miss Landmine, I would of course never had gone through with it." The resulting Web site, which allows viewers to vote for their favorite candidate, is jaw-droppingly provocative. It has courted criticism, of course -- some say that it's misogynistic or an exploitative "freak show." But Traavik says the tendency to feel pity for these women and to view them as "freaks" is exactly what he's trying to fight. Jill at Feministe (where I originally found the link) writes, "Seeing women in bikinis isn't exactly revolutionary; but seeing women whose bodies are outside of the thin, white, able-bodied ideal in bikinis can feel pretty ground-breaking." 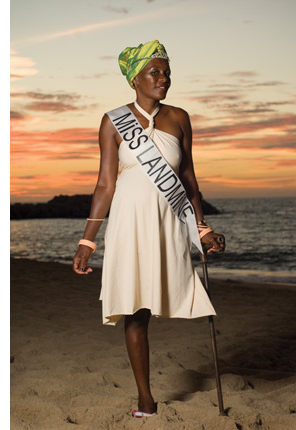 As its manifesto suggests, the pageant challenges accepted norms of beauty not only in presenting land mine victims who are undeniably attractive but also in showing women well beyond the typical pageant age and with body types thick and thin. One of this year's contestants is pregnant, in fact, and shown wearing a form-fitting spandex dress. I can't help detecting a touch of grim irony underlying the project, though. The project's narrative essentially goes: Do-gooders come to a country ravaged by civil war to empower poverty-stricken land mine victims while trumpeting the "Everybody has the right to be beautiful" motto. They choose contestants who are largely unemployed and have far-fetched dreams of becoming a nurse, interior designer or simply someone's boss. They are outfitted for a photo shoot in American Apparel -- a clothing line well outside of their reach and, of course, known for its sexualized depictions of women. They're photographed in Angola's tourist destinations (poolside, in a ritzy hotel lobby or along a hotel's striking stretch of beach) -- a world they will certainly never inhabit, not even as employees. And the do-gooders set out to address the greatest crisis in the life of, for instance, a maimed 19-year-old unemployed pregnant woman -- that she doesn't feel beautiful?